We’re a relatively new company. I opened the doors for business in June of 2015. And, after learning a lot about how to serve our first customers, we’re doing great work and growing. After months of trying to find people who would listen politely (and hopefully ask critical questions) about my new venture, I’m happy to tell you that lots of people I don’t already know have finally started asking! Can I talk with a current customer? But, we’re meeting new people all the time and they keep asking. Which is great! So, for everyone who haven’t asked yet, or who may have forgotten my earlier, less confident attempts to answer, let me tell you now. 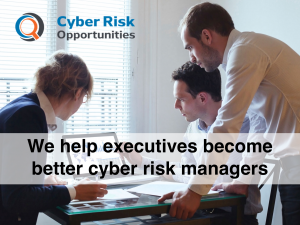 I formed Cyber Risk Opportunities to help executives become better cyber risk managers. That’s our mission. Everything we do comes back to that. Cyber risk has become more than an obscure, low-priority technology problem. Yes, our use of technology has gotten us into this awkward place. If we could disconnect from the Internet, it would lower our cyber risk quite a bit. But that’s not really an option anymore, is it? So, the CEO and their team have to be at least as good at managing their cyber risks as they are at managing their risks in sales, order fulfillment, and accounts receivable. It’s that important. We want our customers to thrive online. And that’s difficult enough to do on a good day. But these days, there are hoards of cyber criminals coming after us and cyber armies shooting through us at their enemies. The tech firm Code Spaces and law firm Puckett & Faraj were put into bankruptcy due to cyber risks that quickly wiped them out. Large companies like Uber, Merck, Equifax, and Hollywood Presbyterian Medical Center have felt the sting. So have small companies like a pediatric dentist in Springfield, Missouri called the Smile Zone who silently lost $205,000 out of their checking account. Next week, Ill tell you more about how we fulfill our mission and how were different. Thanks for being on this journey with us!